And I fell ill… 20. March 2018 – tulen loobin su katusele kive! I had a mild headache in the morning but didn’t think much of it and went to work. However, I started feeling gradually worse during my commute to work, so I had a terrible headache, dizziness and cold shivers when I got to work. Such a bummer. This is the worst timing ever, right before my vacation next week. Ugh. I took a taxi home and spent most of the day sleeping. 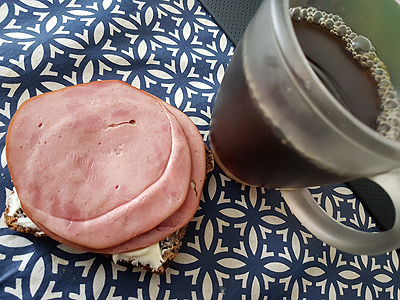 Very late breakfast around 4pm: nettle rye bread with butter and ham and lukewarm coffee that was left over from morning. Since I felt so sick in the morning I didn’t manage to drink my coffee then and I really didn’t have the energy to make a new pot. We ordered in dinner, because in no way was I going to manage to cook. 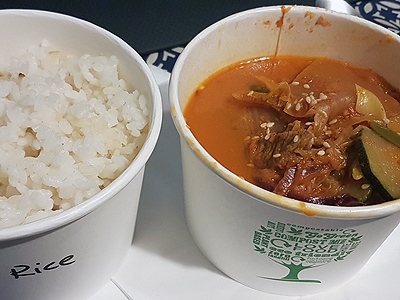 I had some rice and super spicy kimchi stew from Gotsu, Kyuho’s Kitchen. The spices warmed me up nicely. 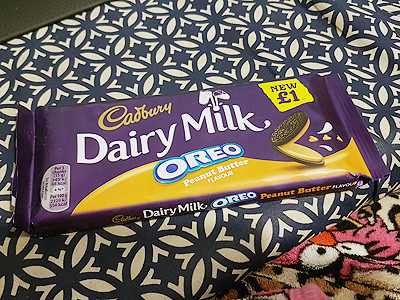 A few pieces of this peanut butter oreo chocolate. I didn’t like this very much, which is weird, because how can you go wrong with chocolate and peanut butter?